N816-16-17C, SPRING REWIND REEL, call for reel specs. See series spec sheet here for addiotional information. N515-16-17C, HIGH PRESSURE SPRING REWIND REEL To handle single 25 ft. of 1/4" or 25 ft. of 3/8" I.D. hose. See detailed spec sheet here for dimensions and addiotional information. Great for Chassis Grease, Hydraulics and Air/Water. N716-14-16-8C, HIGH PRESSURE SPRING REWIND REEL To handle single 25 ft. of 3/8" or 25 ft. of 1/2" I.D. hose. See detailed spec sheet here for dimensions and addiotional information. Great for Lubrication, Air/Water, Assembly Operations, Washdown, Air Tools and General Industrial Applications. N515-16-17C, HIGH PRESSURE SPRING REWIND REEL To handle single 35 ft. of 1/4" or 35 ft. of 3/8" I.D. hose. See detailed spec sheet here for dimensions and addiotional information. Great for Chassis Grease, Hydraulics and Air/Water. N716-16-17C, HIGH PRESSURE SPRING REWIND REEL To handle single 35 ft. of 3/8" or 35 ft. of 1/2" I.D. hose. See detailed spec sheet here for dimensions and addiotional information. Great for Lubrication, Air/Water, Assembly Operations, Washdown, Air Tools and General Industrial Applications. 816-19-20J, SPRING REWIND REEL, call for reel specs. See series spec sheet here for addiotional information. 716-16-17C, SPRING REWIND REEL, call for reel specs. See series spec sheet here for addiotional information. 716-19-20C, SPRING REWIND REEL, call for reel specs. See series spec sheet here for addiotional information. 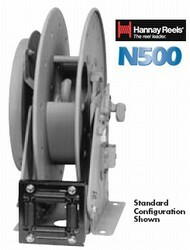 N515-16-17C, HIGH PRESSURE SPRING REWIND REEL To handle single 50 ft. of 1/4" or 50 ft. of 3/8" I.D. hose. See detailed spec sheet here for dimensions and addiotional information. Great for Chassis Grease, Hydraulics and Air/Water. 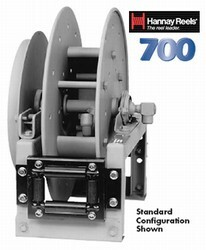 N716-19-20J, HIGH PRESSURE SPRING REWIND REEL To handle single 50 ft. of 3/8" or 50 ft. of 1/2" I.D. hose. See detailed spec sheet here for dimensions and addiotional information. Great for Lubrication, Air/Water, Assembly Operations, Washdown, Air Tools and General Industrial Applications. 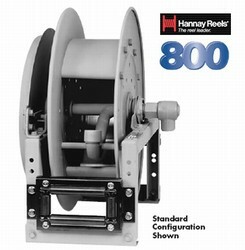 N718-25-26-15.5G, HIGH PRESSURE SPRING REWIND REEL To handle single 100 ft. of 3/8" or 100 ft. of 1/2" I.D. hose. See detailed spec sheet here for dimensions and addiotional information. Great for Lubrication, Air/Water, Assembly Operations, Washdown, Air Tools and General Industrial Applications. 716-19-20J, SPRING REWIND REEL, call for reel specs. See series spec sheet here for addiotional information. 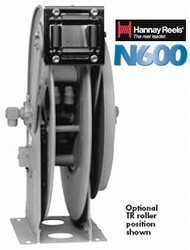 N515-16-17C, HIGH PRESSURE SPRING REWIND REEL To handle single 75 ft. of 1/4" or 75 ft. of 3/8" I.D. hose. See detailed spec sheet here for dimensions and addiotional information. Great for Chassis Grease, Hydraulics and Air/Water. N716-23-24-15.5J, HIGH PRESSURE SPRING REWIND REEL To handle single 65 ft. of 3/8" or 65 ft. of 1/2" I.D. hose. See detailed spec sheet here for dimensions and addiotional information. Great for Lubrication, Air/Water, Assembly Operations, Washdown, Air Tools and General Industrial Applications. 716-23-24-15.5J, SPRING REWIND REEL, call for reel specs. See series spec sheet here for addiotional information. N816-19-20J, SPRING REWIND REEL To handle single 25 ft. of 3/4" or 15 ft. of 1" I.D. hose. See detailed spec sheet here for dimensions and addiotional information. Great for Fuel Dispensing (Consult Factory), Waste Oil Evacuation and Air/Water. 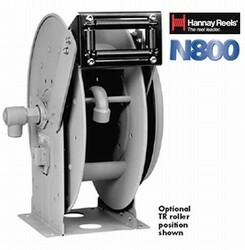 N615-19-20C, DUAL SPRING REWIND REEL To handle dual 35 ft. of 1/4", 35 ft. of 3/8" or 20 ft. of 1/2" I.D. hose. See detailed spec sheet here for dimensions and addiotional information. Great for Hydraulics, Air/Water and Spray Painting. N816-23-24J, SPRING REWIND REEL, call for reel specs. See series spec sheet here for addiotional information. N818-23-24J, SPRING REWIND REEL To handle single 50 ft. of 3/4" or 25 ft. of 1" I.D. hose. See detailed spec sheet here for dimensions and addiotional information. Great for Fuel Dispensing (Consult Factory), Waste Oil Evacuation and Air/Water. 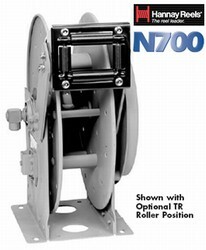 N617-19-20J, DUAL SPRING REWIND REEL To handle dual 50 ft. of 1/4", 50 ft. of 3/8" or 25 ft. of 1/2" I.D. hose. See detailed spec sheet here for dimensions and addiotional information. Great for Hydraulics, Air/Water and Spray Painting. 816-23-24J, SPRING REWIND REEL, call for reel specs. See series spec sheet here for addiotional information. ~SPEC ROLLER POS N716-23-24-15.5G, HIGH PRESSURE SPRING REWIND REEL To handle single 100 ft. of 1/4", 75 ft. of 3/8" or 65 ft. of 1/2" I.D. hose. See detailed spec sheet here for dimensions and addiotional information. Great for Lubrication, Air/Water, Assembly Operations, Washdown, Air Tools and General Industrial Applications. 716-23-24-15.5G, SPRING REWIND REEL, call for reel specs. See series spec sheet here for addiotional information. 'SPEC ROLLER POS 716-30-31-15.5B, SPRING REWIND REEL, call for reel specs. See series spec sheet here for addiotional information.